Relationship problems, family issues, social skills difficulties, shyness, embarrassment, nervousness or anxiety can be worked through in group psychotherapy. Group therapy is a powerful tool that focuses on the relationship between the individual and the group, emphasizing the social nature of human experience. As a method of treatment, group therapy offers an approach that recognises how emotional, behavioral and psychological phenomena emerge in the context of our social groups. Carefully constituted groups have a long record of helping people with personal and psychological problems. Group therapy can be intensive and demanding but it provides an intimate space for connecting with others who face similiar issues and challenges; it provides a mirror for one´s true self and leads to better self-acceptance and self-knowledge. 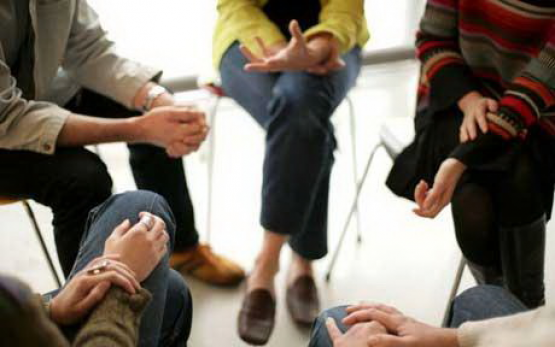 "Group psychotherapy is a long - term proven, very efficient and useful form of psychotherapy. It is as beneficial and, in some cases, even more so when compared to an individual therapy. It can be especially helpful when the important tasks of therapy is the social support and learning of interpersonal relationships. A majority of people taking part in a group therapy benefit from such a therapeutic experience"
A new long-term psychoterapeutic group for English speaking clients is starting in 2018 in Prague. Psychotherapy groups offer an effective tool for self-development. As human beings, we are thrown into social environments that co-determine and form our identities - the sense of who we are; what we consider important, how we perceive and view ourselves and others, or how and with whom we form relationships. Thanks to the similarities between therapeutic groups and other social environments, groups can offer a relatively quick understanding of problems in interpersonal relationships; groups can also provide new, enriching experience of relatedness. Group psychotherapy can be - in some cases - an effective addition to individual psychotherapy. It can also provide great insights to anyone who participates on teams and work groups of any type or in helping professions and health care. Your insight, wisdom and understanding of human relationships is likely to grow thanks to the exploration and better understanding of interpersonal issues and complexities in the group. This new experience and understanding will likely lead to connecting with people in other environments in more satisfactory ways. Exploration and understanding of dreams and other mental and spiritual experiences may also lead to psychological gains. No previous experience with psychotherapy is necessary to join the group. On the other hand, your interest in self knowledge, relationships, and your willingness to heal yourself as well as a desire to help others are important. Commitment to joining the group for a certain period of time, at least one year is recommended, can bring significant improvement in communication skills and personal relationships. Prague Psychotherapy Group in English – where and when? The group will meet once a week for 90 minutes. It will consist of approximately 10 people, both males and females. The group will be conducted by two psychoterapists – a man and a woman. This group will meet each Wednesday in late afternoon /early evening close to Karlovo náměstí (yellow/B metro line). Not all issues that can motivate a person to pursue group therapy can be listed here. An interview with group conductors will help determine of whether this group will be helpful to your specific problems. Compared to individual therapy, groups provide a greater sense of belonging. The opportunity to share concerns with others and listen to their reflections and observations is highly valued. People often feel alone in their distress, and learning that others experience similar problems can be of great importance - as well as learning that others may have different perspectives or experiences in similar life situations. Interpersonal problems are a frequent indication for group therapy. Does everyone in the group have the same problem? People often come to groups with a number of issues concerning family, relationships, work, social contacts, anxiety, loss, bereavement, depression or a wish to have a better life. Part of the leader´s job is to select group members so that everyone gets an opportunity to profit from the experience. What happens if I know someone in the group? This is a common worry but such situation rarely arises. Every effort is made to ensure you don’t know the other group members. Is there an agenda or a set topic for each group? Group members are encouraged to speak freely about anything that comes to mind, past or present, including communications and relationships within the group. Facilitators are not active, but rather serve as guides through group processes and secure the setting and sense of safety in the group. How can I be sure that things I say be treated as confidential? Group members are asked to agree they don’t talk about personal topics raised outside the group. Confidentiality is an important part of creating a sense of security and safety. What if I find the idea of talking before others intimidating? This is a very common concern that is frequently overcome upon the realizing that others have struggled with similar doubts. It may take time, especially if you have feelings of being excluded from groups in your history, or if you suffer of feelings of inadequacy or lack of confidence. We recommend - be patient with yourself and give yourself time. Graduate of Charles University, Prague. Group training in depth and dynamic psychotherapy, 5 years. Dasein-analytic exploration of dreams, 2 years.